The minutes of the July FOMC meeting are out, giving forex traders a glimpse of what really went down during the Fed’s top-secret huddle. So are we about to see white smoke coming out of the rate hike chimney anytime soon? While it’s no secret that the U.S. central bank is considering tightening monetary policy at some point, Fed officials have been pretty coy on when this “liftoff” might start. Recall that the July FOMC statement indicated that policymakers are still waiting to see further improvements in employment data and would like to feel assured that inflation would soon reach the 2% target before deciding to make any moves. Majority of the committee members assessed that economic conditions weren’t ripe for a liftoff just yet, especially since downside risks to inflation are still present. The freshly released CPI readings supported this outlook since both headline and core readings printed feeble 0.1% gains and came short of expectations. Policymakers even pointed out that the effects of dollar deprecation on price levels could start fading, possibly leading to another leg lower for commodity prices and energy costs. And that’s before oil and gold prices staged a sharp selloff lately! When it comes to the labor market, Fed officials acknowledged that the U.S. economy is making good progress in moving closer to maximum employment. In particular, they cited increases in payroll gains and job openings, as well as declines in the unemployment rate and broader measures of labor underutilization. However, many also highlighted the slow pace of growth in wages, as this suggests that there’s some slack left to be absorbed and that there’s still room for improvement. In a nutshell, the July FOMC minutes revealed that Fed officials are pleased with the green shoots in the U.S. economy but would like to see those bear fruit. It’s an interest rate hike we’re talking about here, after all, so they can’t really afford to make any mistakes that might wind up ruining the ongoing recovery. Patience, people! Unfortunately for U.S. dollar bulls, being patient doesn’t quite cut it. The overall reaction to the July FOMC minutes was a bearish one, as most forex market watchers were probably disappointed with the lack of confirmation that a September rate hike is in the cards. Interestingly enough, volatility picked up earlier than the actual release since the minutes were leaked around ten minutes before schedule. In my previous articles, I’ve mentioned that the next NFP release might seal the deal for a September rate hike but it seems that inflation could still be a deal breaker. The subdued pickup in price levels and the possibility of seeing further declines in commodity prices is keeping most Fed officials in a hesitant mood for now, and these folks seem willing to err on the side of caution. 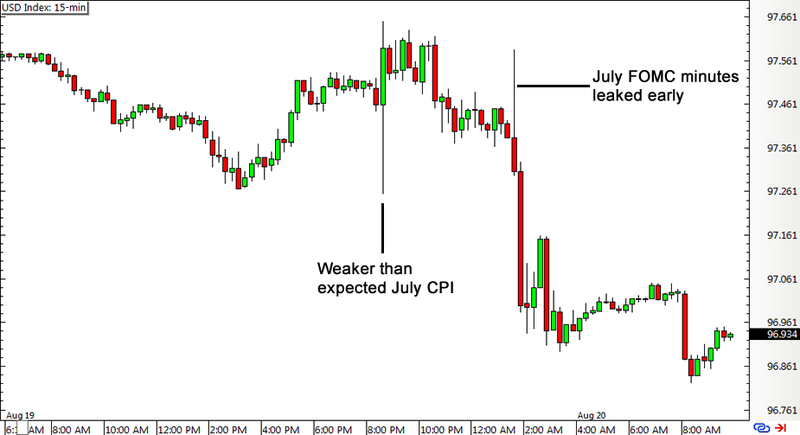 Do you think the July FOMC minutes suggest a later rate hike?